Frigo Manager the only app in the store to handle the food in the fridge (and freezer). How many times have you happened to have purchased foods that have had, or even worse to have them thrown away because it expired ??? With Frigo Manager will not happen again !!! Expired foods will be just a bad memory, because you'll have an eye on what you have in the fridge and the expiration date. The use of app is very simple: just add the products purchased, by entering the description, the expiration date, the category and the amount (optionally you can also insert the date of purchase, auto insert in the shopping list ,a note and mark the product as frozen) and you're done! 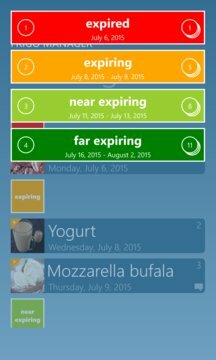 With a simple and clean interface you'll see the list of products in the fridge (and freezer) sorted by the expiration date and colored for their state. Of course, you have the ability to edit the product, remove the quantity or remove it completely. 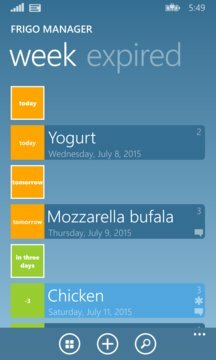 tile, tile for shopping list, toast notifications, function search recipes, reading the page displayed, voice commands, shopping lists, calendar creation, searching, OneDrive backup, favorites, post-it, etc. Supports us rate and review the app, we accept tips and suggestions.
" An app should be useful for real life! "